Tough, highly adaptable and efficient, the Parachute Regiment has established itself as one of the finest fighting forces in the world. 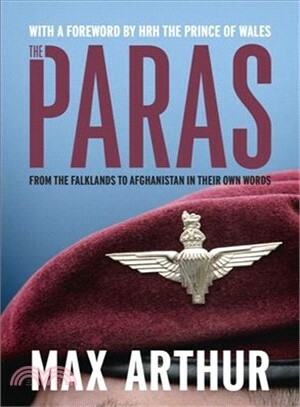 On the occasion of the 75th anniversary of its founding, renowned historian Max Arthur has compiled this enthralling oral history of the modern Parachute Regiment. This unique chronicle is told through the voices of more than a hundred of the soldiers themselves, and of those involved closely with them. Whether in the Falklands, Kosovo, Iraq, Sierra Leone or Afghanistan, the Paras have maintained their reputation for being where the fighting is fiercest and where the odds of survival are often stacked heavily against them. The gripping, visceral first-person narrative makes The Paras stand apart from conventional regimental histories as one of the most remarkable accounts of conflict ever published. Max Arthur is acclaimed for his specialty in sourcing first-hand recollections of the twentieth century, particularly the First and Second World War. He is the author of many bestsellers including Forgotten Voices of the Great War and Forgotten Voices of the Second World War which were both written in association with the Imperial War Museum. He was recognized in the 2013 New Year Honours with an OBE for his services to military history.